This 4-hour bike tour is the perfect way to spend a day in Barcelona. The knowledgeable English-speaking guide will give you useful tips and advice about what to do and see in Barcelona. It's a fun and informative outdoor experience! The tour is easy-going: there aren’t any hills and you will make stops every few hundred meters to take photos and hear the fascinating history of Barcelona. You will see the medieval heart of the city and the Gaudi buildings of the 19th-Century expansion. Ride through the green Parc de la Ciutadella and pop down to the beach. End your tour with a great overview of the city, and a feeling that you have gotten to know Barcelona while enjoying a fun experience. Fun, sporty and cultural - a great way to discover a new city! 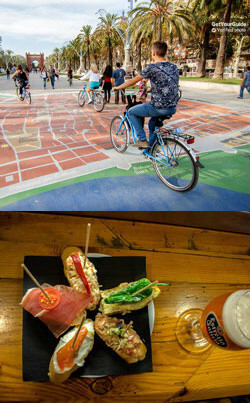 This 3-hour tour is a perfect combination: Biking, culture and... Tapas! You will see the historic Gothic Quarter with its narrow streets, little squares and antique buildings. One highlight of this quarter is the imposing 13th-century Cathedral of Santa Eulalia! With its many stops, you can take pictures and you’ll get to enjoy the laid-back Spanish ambiance. Next, you will relax by the sea to enjoy some delicious Spanish tapas. While eating your tapas, you can take a deep breath of the fresh sea-air and have nice view! Take a glass of Spanish wine, beer, or a drink of your choice and learn something about the origins of this typically Spanish way of eating - and discover how to prepare some of the served tapas for yourself. Discover the city and enjoy some delicious tapas on the beach!